About 200 years ago, Kuldhara was home to more than 1,500 Paliwal Brahmins, a community that had been living there for more than five centuries. But one day, the entire population fled overnight. According to local lore, the people of Kuldhara left the village but with a curse, forbidding any future settlements and so whosoever tried to live there would be found dead. Kodinhi lies in the Malappuram district of Kerala, 35 kms south of Calicut. Also known as the Village of Twins, Kodinhi has more than 200 pairs of twins and two sets of triplets. The interesting thing is that women from Kodinhi who are married outside this village also have multiple births! No one has been able to determine the reason behind this mystery yet! Every year when the ice melts in Roopkund- a glacial lake located at a height of 16,500 feet- people see hundreds of human skeletons floating. Nobody knows for sure who these people were, but a popular myth says that the skeletal remains are of King Jasdhawal of Kanauj, his pregnant wife and hundreds of servants who were going on a pilgrimage to the Nanda Devi shrine but were caught in a terrible hailstorm and group perished near the lake. The skeletons found are told to be 1,200 years old! Jatinga is a small village in Assam, famous for a mysterious phenomenon that happens every year during the late monsoon. Right after sunset, hundreds of migratory birds commit mass suicide here and this happens every day! According to the villagers there is some evil spirit in the sky and is responsible for the event. However, there is no explanation as to why these birds get trapped in the same place every year! Built by French missionaries in the 1860’s, the Rosary Church was the centre of all community activities. Exactly 100 years later, Indian Government built the Gorur Dam, which now floods the Hemavathi Reservoir. The church was left to fight against the water and since then, the Rosary Church has been submerging every year during the monsoons and resurfacing as the water levels recede. Originally built in the 15th century, the Vittala Temple has a collection of 56 pillars, which produce musical sounds when tapped gently. Pre-Independence, the British were so intrigued by the pillar’s music-producing ability that they cut two pillars into half to check if anything was inside, but they only found hollow pillars of granite. You can still check out these two pillars at the Temple. Built in the 17th century, the fort even has an Archaeological Survey of India’s notice board outside the fort that forbids entry between sunset and sunrise. The fort was earlier known for its beauty and the Pink City of Jaipur was modelled after it. But gradually, the fort lost its charm and turned into a haunted place. People say that it is haunted the evil soul of a magician who was in love with the princess of Bhangarh, but never got her. Even tourists claim that they feel uneasy upon entering the fort. The shrine is known for one special rock that weighs 70 kg and can be lifted only by one means. To lift the rock, 11 people are required to gather around it, touch it with their forefingers and loudly call out the name of the saint who placed a curse on it and the stone magically rises up in the air! The people believe that a Sufi saint called Qamar Ali placed a curse on this stone which was used for body building 800 years ago. A man named Om Singh Rathore (Om Banna), died at this very spot in a tragic accident while he was riding back home on his Bullet. When the police took the bike, emptied the fuel tank and bound it with chains, it would still return to the same spot before daybreak every day. The authorities finally gave up and the locals built a temple around this bike. If a traveller is lost or needs help, they claim that Om Banna rides his bike and arrives to help them! This beach makes it to this list because it is the backdrop for many spooky tales. People strolling on the beach hear whispers and find no one when they look around for the source of the sound. There have been also reports of disappearances on the beach. The beach was previously a burial ground for Hindus, and people say that is full of spirits! These marshes of West Bengal freak out everyone. There have been many sightings of unnatural glowing lights of different colors that hover over them. Referred to as ‘Aleya Lights’, they have become nightmares for local fishermen as the lights confuse them and they lose their way. Several fishermen have even lost their lives due to these strange lights which are an unexplained phenomenon. In this 178-year-old palace, whenever a guard dozes off on duty, they are apparently slapped and there is no one in sight! According to the belief, the man who slaps them is a ghost named Major Burton. He was murdered by Indian sepoys and is said to haunt this palace! Located in Orissa, Chandipur Beach is also known as Hide-and-Seek Beach due to its nature. Imagine an entire beach appear and disappear in a matter of one day! On one occasion you may witness the water and on another nothing but casuarina trees and sand dunes. This happens every day and whatever the reason, the phenomenon is very rare. A boy is said to be travelling from the road and vanishing into the dense forest. Locals have claimed that there have been strange sightings and experiences and anyone who comes across this scene commits suicide due to depression. Not only that, there have been murder cases as well! If you think this is a typical tale, then it’s not! When you make your way through the isolated and lush area of Delhi Cantt, you encounter a lady clad in a white saree. She asks for lifts and knocks on doors of cars passing by. Speeding up your vehicle does not help since she matches your speed and stopping is also not a good option! Two noble saints named Jamali and Kamali were buried at this mosque. People have claimed to witness some strange occurrences; some have been slapped by invisible hands while some were chased by the wind. You can also hear cries in the night and that is why the mosque is avoided post sunset. Creeped out already? 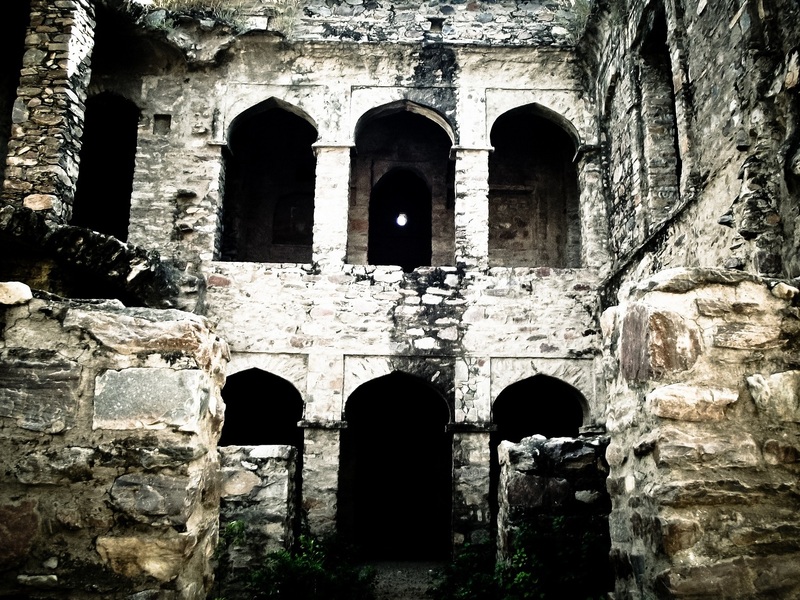 Know more haunted places in India? Share with us in the comments below!